AKG's form for making quality cans for mixing is well known. How do these new models compare with their previous flagship design? The X32 Compact takes the heart of Behringer's flagship console and crams it into a cheaper, smaller package. We put it to the test. The main body of the library is made up of 945 files, available in both Acidized WAV and Apple Loops formats. A new Prophet is always an exciting prospect, but the name certainly carries a weight of expectation. Can the latest model live up to its illustrious ancestry? A powerful modulation system means there's more to FXpansion's delay, filter and distortion effects than meets the eye. The Streetly Tapes series of expansion packs for Gforce's M-Tron Pro aim to get as close as possible to an authentic Mellotron experience. What does the current crop of premium control surfaces have to offer? Read our round-up to find out. While the latest version of Hughes & Kettner's Red Box guitar amp DI adds some new tone-shaping options, the basic equation behind the Red Box remains unchanged. It's clear where its inspiration lies, but is MFB's 'Analoger Drumcomputer' equal to fabled Roland machines of yore? The third instalment in Quantum Leap's Stormdrum series explores the private percussion collection of a legendary American drummer. The Level Or is a modern take on the Shure Level Loc, which was a small — and rather trashy — PA limiter designed in the '50s. The latest mic from the Telefunken stable has no fewer than four different voicing options. Is this the last kick-drum mic you'll ever need? Rock Classics is a further release in Ueberschall's Elastik-based loop library series. The recorder is an odd instrument: most of us have played it, yet it rarely appears in sample libraries. VSL have set out to remedy that by sampling four instruments of the recorder family. Warm Audio's latest preamp offers surprisingly high quality in an affordable package. Craft the perfect take using Sonar X3's new Track Lanes. In the second part of this exploration of the craft of sound design for visual media, we reveal the skills needed to make good music edits. Understanding Reason's Patch Browser can help you to work faster and more efficiently. With the Chord Track, even the most keyboard-phobic and ham-fisted of composers can play in their piano parts! 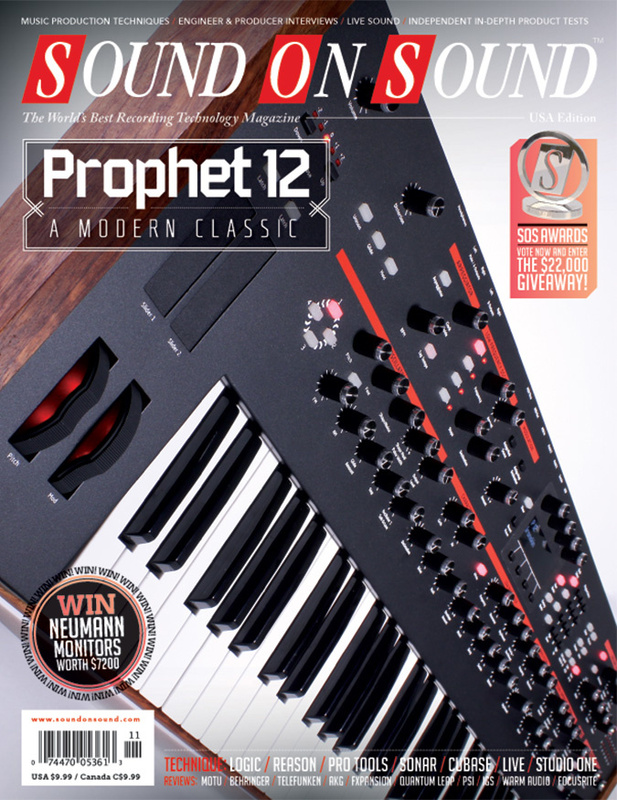 A reader's carefully crafted symphonic synth epic gets the SOS mix makeover treatment. Nearly 30 years into its history, Mark Of The Unicorn's flagship recording package makes its first appearance as a Windows application. How worried should MOTU's competitors be? If you rely on Pro Tools, it's worth taking steps to avoid RSI. Discover untold creative possibilities with Logic's powerful new MIDI plug-ins. A free upgrade to Studio One offers several welcome new features. Recording an instrument for the first time in an unfamiliar room can be a rewarding experience — if you set about it in the right way! This month Draft Punk, Steep Canyon Rangers, Justin Timberlake and Classic Mix album - Chris De Burgh's Lady In Red. Its status as one of pop's most influential albums is clear, but the circumstances surrounding the creation of The Velvet Underground & Nico have always been clouded. We asked Andy Warhol's co-producer to set the record straight. Is it just me or have today's software GUI designers been turned by the dark side? Will Gregory took the unconventional decision to base Goldfrapp's latest album around a single instrument — which he couldn't play! For Jonathan Wilson, the quality of recorded music peaked in late-'70s LA. His own production career has been a quest to scale the same heights. Backstage at a major festival in France, we caught up with the man who has been mixing one of the biggest names in punk for the last 14 years. This month we review work from David Youngs, Autocue, Daylight Fireworks, hanna*h*, Bernie, Peter Fitzpatrick and Rubyrough. Love And War was not only a remarkable comeback for singer Tamar Braxton, but a breakthrough opportunity for engineer and mixer Mikey Donaldson. Time To Ditch Lossy Audio For Music Delivery? Is it about time we got rid of lossy audio formats for music delivery? Q. Should I buy a hardware sampler? Read more about Q. Should I buy a hardware sampler? Q. What makes different models of mic sound different? As far as I can see, if the noise and distortion figures are adequately low, the only obvious difference between microphones must be in the frequency response. Read more about Q. What makes different models of mic sound different? Q. What's the best way to record a psaltery? Read more about Q. What's the best way to record a psaltery? Making a good living from music isn't as hard as they say. Getting people to believe that you make a good living from music can be impossible. Audio networking looks set to be the next big thing — but will it make your music better? Media content for the November 2013 issue.